Our elf, Fred, will be making his big arrival this weekend & I can't wait! I'm one of the crazy ones who actually loves when he comes. 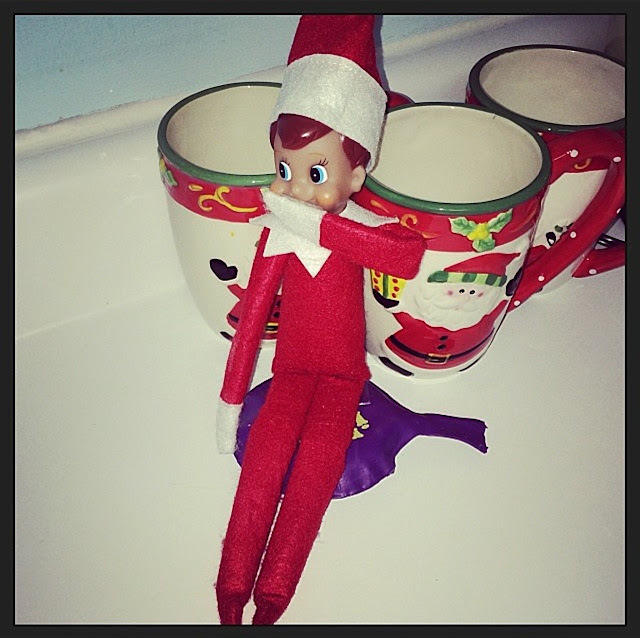 I think it's because my kiddos get so stinkin' excited to find him every morning! If you're anything like me though, you run out of ideas pretty much the 3rd day into it. 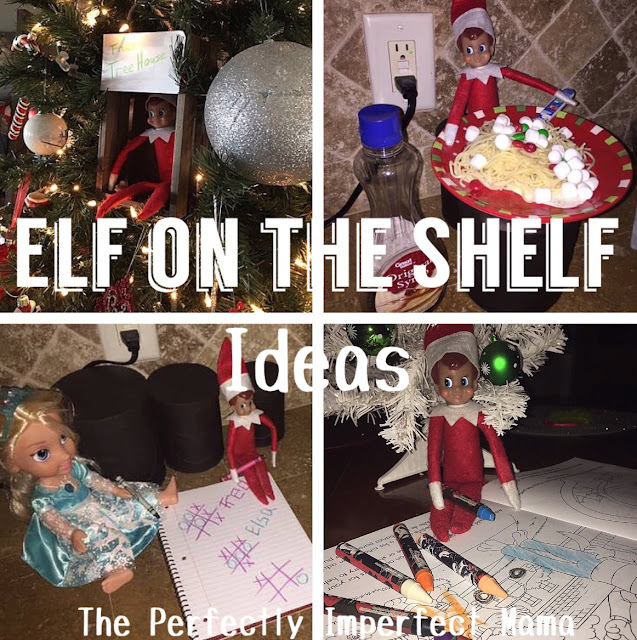 I find myself searching & searching on Pinterest to find creative things but lets face it, sometimes that silly elf ends up just being stuck in a stocking or the tree. 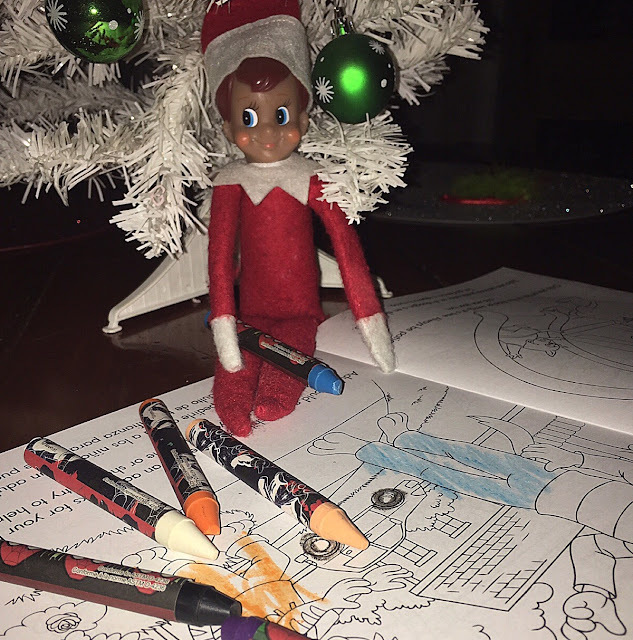 So today I thought I would share a few things we Fred has been up to in the years past & maybe it can help you with your elf! 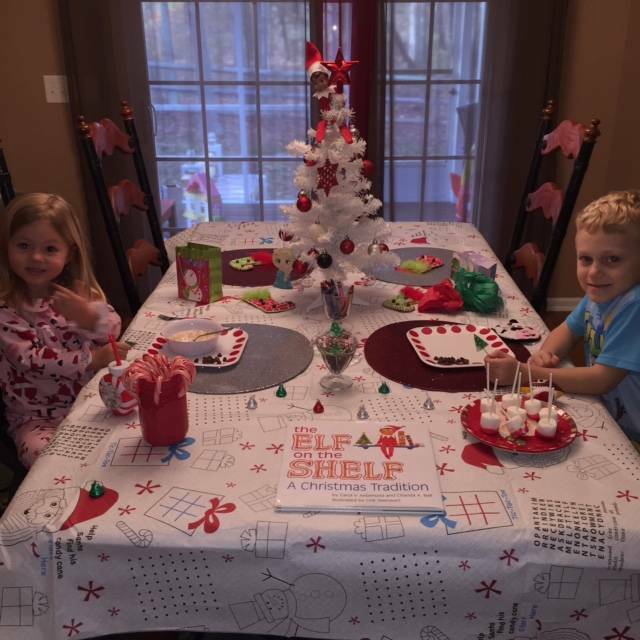 One of my most favorite Christmas traditions is our North Pole breakfast. Oh I just love it so much! The very first morning Fred comes, our kiddos wake up to a big party [breakfast] he has thrown. Eeeek! I had actually never even heard of this the first two years we did the Elf on the Shelf tradition until I started following Andrea's blog. After seeing all of her pictures & ideas, I just knew it was a tradition we needed to start! Thanks Andrea! I don't know why but my kiddos always love to find Fred coloring. He took a small basket we keep on the stairs & made a tree house. This is a great idea if your elf falls off of wherever he/she was or if your child touches him/her. 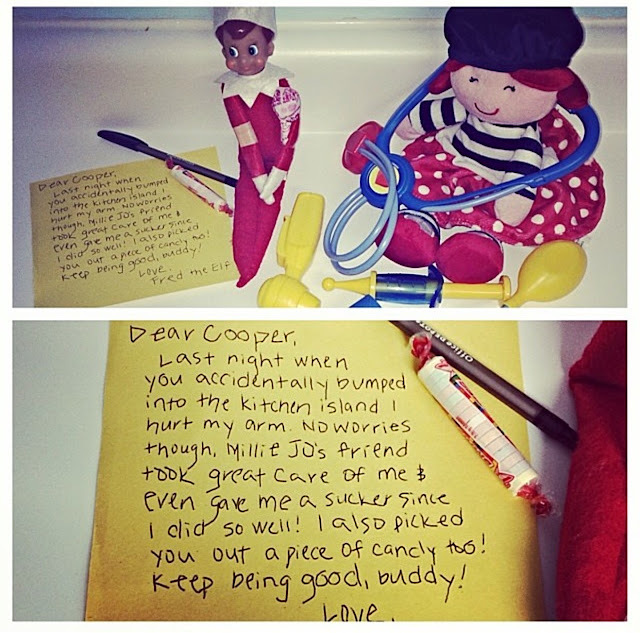 One year Cooper accidentally knocked Fred off our island & the next morning he woke up to find him like this & with this note. Why is a whoopee cushion so darn funny!?! ... & not just for kids! Sitting in Santa's sleigh & roasting a marshmallow over a candle! This is a super easy idea after you have decorated a gingerbread house! Another "Dan idea" 😉 hence the mess but it was fun to see our kiddos reaction. Grab barbies, wrestlers, board games, stuff animals or action figures & let them all have a game night! Grab a notepad, crayons & a doll/stuffed animal/action figure & let them play a few games of Tic Tac Toe. If you have the figurines from Frozen, stick them in the freezer with Fred. Your kiddos will LOVE it! Sit your elf in the refrigerator with a glass of milk. 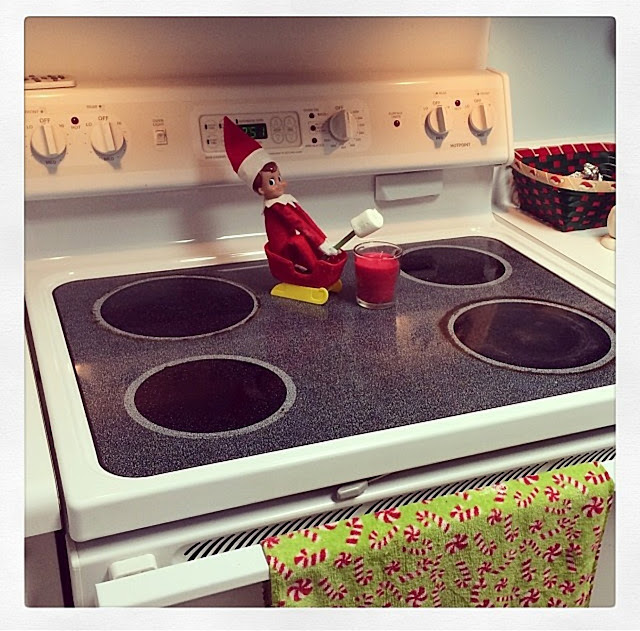 Use green or red food coloring to turn the milk into elf milk! 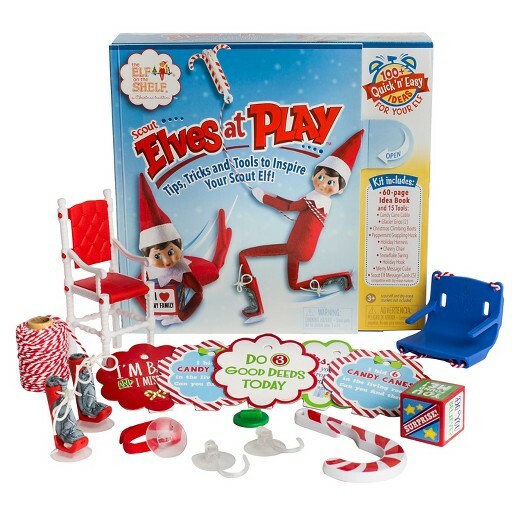 Let your elf get stuck in a jar of Hershey Kisses while they were trying to sneak one! Speaking of Hershey Kisses ... HA! Unwrap a Hershey Kiss, put it in a small glass, grab the air freshener & toilet paper & set it all up in the bathroom. We had leftover noodles one night from dinner so we put those on a plate, added M&M's, marshmallows & syrup. 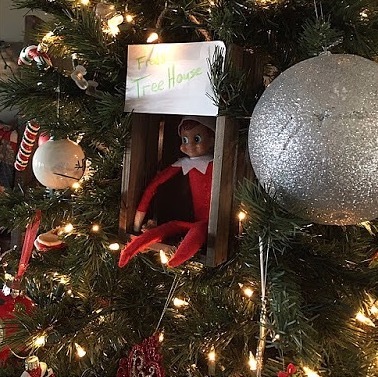 If you have a little girl, chances are she has a doll house or Barbie house that has a bathtub just the right size for your elf. Toss some mini marshmallows on top of him/her & you have a bubble bath! A few ideas I have & now it's your turn to share! You can also check out my Christmas Pinterest board for new ideas I've pinned for this year! Before I go, have y'all seen this!?! I mean whhhhat!?! I didn't even know this existed! I'm kind of loving it though. Do y'all have this!? You can find it here.